Last Wednesday, the United Nations Security Council unanimously passed Resolution 2277 (2016), renewing the mandate until March 31, 2017 to maintain current force levels of 19,815 military personnel in its stabilization mission in the DRC, the UN Organization Stabilization Mission in the Democratic Republic of the Congo (MONUSCO). Perhaps more noteworthy was the Security Council’s emphasis on the importance of a “transparent and credible process” in holding presidential and legislative elections in the DRC. It is unusual that the UNSC would unanimously pass this resolution, especially given the typically staunch position of permanent members China and Russia on non-interference in internal affairs of other countries. Resolution 2277 (2016) marks only the latest instance of mounting international pressure against the incumbent Congolese regime to carry out free and fair elections according to the constitutional mandate. The resolution comes amidst growing pressure on President Kabila to hold elections on time and to step down as is Constitutionally mandated, including the threat of targeted sanctions if the Congolese government does not hold them. 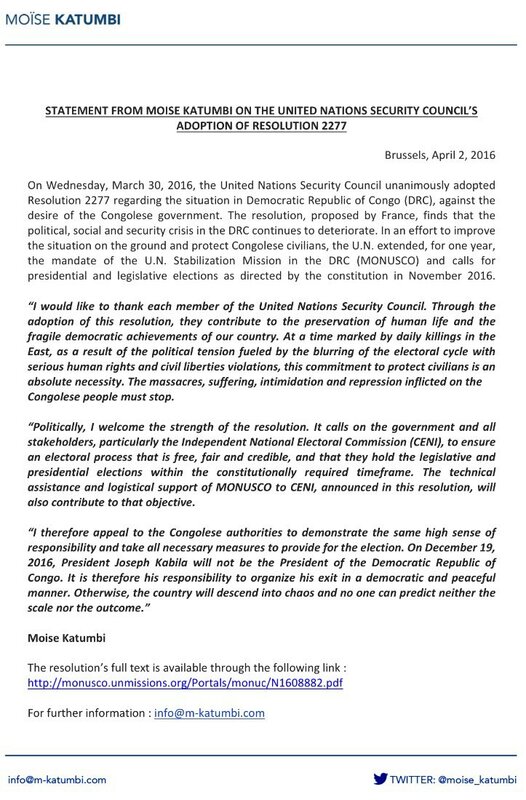 A resolution passed by the European Union Parliament on March 10 and a letter from student activists to Secretary of State John Kerry equally voiced their concerns of the undemocratic election process in DRC, urging the use of targeted sanctions against President Kabila and his inner circle to demand increased transparency. U.S. Senator Ed Markey sent a letter to Secretary Kerry on February 4, echoing echoing the use of targeted sanctions against the Kabila administration to bring about democratic electoral progress. National, regional, and international outcry surrounding the recent government crackdown and arrest of 18 opposition activists from the Lucha (Lutte pour le changement/ struggle for change) group. The Lucha group was peacefully protesting against the detainment of some of its members one year ago. Lucha makes up part of the opposition that instituted a day of “villes mortes” (dead cities) across DRC on February 16 to raise awareness of the democratic danger of election delays. For the official UN communique and the full text of the resolution, see link.